TORONTO, ON - AUGUST 13: Samantha Stosur of Australia reacts to winning a point against Agnieszka Radwanska of Poland on Day 6 of the Rogers Cup. 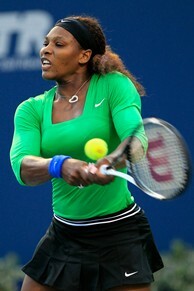 TORONTO, ON - AUGUST 13: Serena Williams returns a shot to Victoria Azarenka of Belarus on Day 6 of the Rogers Cup. TORONTO (AP) - Serena Williams advanced to the final in the Rogers Cup, beating fourth-seeded Victoria Azarenka of Belarus 6-3, 6-3 on Saturday night. The 29-year-old Williams, playing just her fourth tournament since being sidelined for a year by injuries and illness, will face 10th-seeded Samantha Stosur in the final. Stosur beat Poland's Agnieszka Radwanska 6-2, 5-7, 6-2. Williams, the 13-time Grand Slam champion who isn't seeded as she continues her comeback, put in her most dominant performance this week, winning in 1 hour, 17 minutes. Dressed in an emerald green long-sleeved shirt and black skirt, her hair pulled back in a black headband, Williams was the clear crowd favorite at Rexall Centre stadium. The match was her's for the taking when she broke Azarenka's serve on a double-fault to go up 4-3 in the second set. Williams carried all the momentum from that point on, eventually winning on a blistering shot to the back corner that Azarenka had little hope of getting to. Williams was injured shortly after claiming her fourth Wimbledon title. A few days after that victory, she cut her foot on glass at a restaurant in Germany, and underwent two operations. She spent 10 weeks in a cast and 10 weeks in a walking boot. Then she was diagnosed in February with blood clots in her lung, and didn't return to practice court in April. While her philosophical approach to the game might have changed, her biting sarcasm hasn't. The former world No. 1-ranked player is well down in 80th as she continues her comeback, and was asked if she feels like a top-10 player simply disguised in a No. 80 label. The 11th-ranked Stosur, from Australia, will return to the top 10 in the WTA rankings next week.